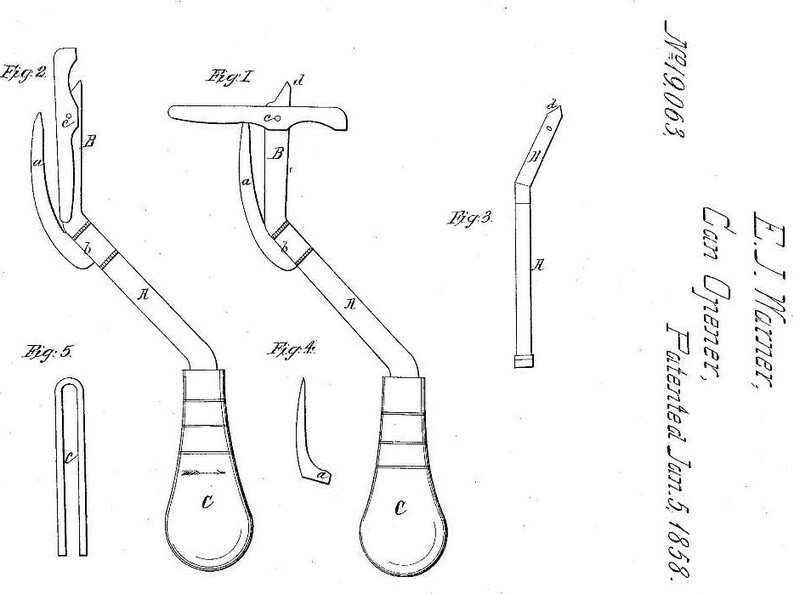 On January 5, 1858, Waterbury native Ezra J. Warner invented the first US can opener. The idea of storing food in cans dates back almost 50 years earlier when Peter Durand of England patented a can made of wrought iron with a tin lining. To open these cans, which could be as thick as 3/16 of an inch, it was suggested that they be “cut around at the top with a chisel and hammer.” Amazingly, it took decades—and Ezra Warner’s design—for a practical can opening tool to be made. By that time, the iron cans were just starting to be replaced by thinner steel cans. Warner designed a pointed blade that, when pressed into the can, was prevented from penetrating too far into the contents by a guard. The guard then swung out of the way and a second curved blade (or sickle) cut around the top of the can with a saw-like action, which, unfortunately, left quite a jagged edge. Though never a big hit with the public, Warner’s can opener served the US Army during the Civil War (1861-1865) and found a home in many grocery stores, where clerks would open cans for customers to take home. A plus to Warner’s design was that it consisted of several parts which could be replaced if worn out. The can opener wasn’t Warner’s first invention. He had received a patent in November of 1850 for a Mode of Fastening Hooks and Eyes upon Cards, a useful holder for a standard Waterbury product. Warner, Ezra J. Patent Number 19,063 - Can Opener. 19,063. Waterbury, CT, issued January 5, 1858. Link.